So the next time you’re sitting around wishing you lived a more exciting life so you could write more exciting blog posts, DON’T. You might end up like me. Who thought that. And then less than twenty-four hours later had the gas main break off the meter on my house. Gas spewed EVERYWHERE. Like evacuate my home and my next door neighbor’s everywhere. Like firetrucks on standby in case of explosion everywhere. Like WHY IS MY HUSBAND ON A BUSINESS TRIP TO PHOENIX RIGHT NOW?! everywhere. Needless to say it was scary. And more excitement than I really ever wanted. But check out this blog post, eh? The wish fairy’s work is apparently done. Anyway. 1.) My house did not explode (luckily all the gas spewed outside and not in) 2.) My neighbor’s house did not explode 3.) My family is safe 4.) I learned that I have REALLY great neighbors 5.) I learned that this sort of thing is common during drought seasons. Who knew? (The ground apparently gets so dry it constricts and pulls on the pipe. Constant pressure like that can lead to breakage. The same can happen with frozen ground in the winter. I’ve just given you one more thing to worry about now, right? Sorry about that.) and 6.) 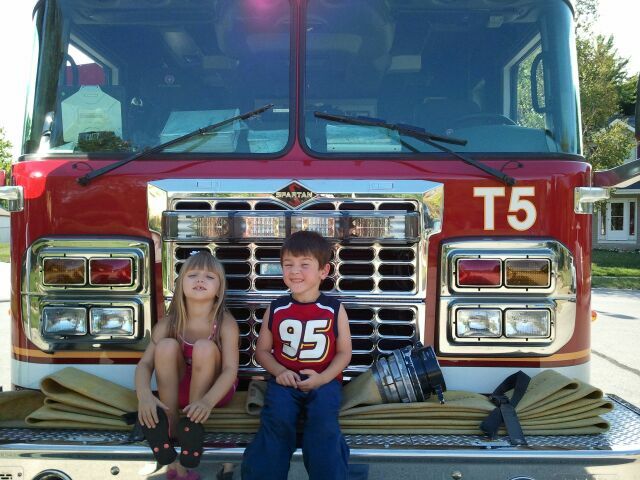 My neighbor snapped this cute picture of my son and her daughter on the fire truck. What doesn’t kill you makes you stronger, I guess. And now my nose is finely tuned to the scent of natural gas (or the scent they scent natural gas with, since natural gas has no scent of its own). At the first hint of odor I’ll start tic-tic-ticking like that gas meter the Nicor guy used to make sure my house was safe. So, wish fairy, I’m perfectly happy with my averagely exciting life. Thank you for proving your point. Tags: blogging, Fire truck, firefighter, Firetrucks, Home Ownership, Natural Gas, neighbors, safety. Bookmark the permalink. Glad everyone is safe. Now that you know the wish fairy exists, you can start wishing for GOOD things as well….why not? What a great picture to get out of a terrible experience! I agree that boring days are better. Here’s to a stunningly dull week ahead…. That is way too exciting for me! This story reminds me of the time I smelt gas in our garage as I was locking up for the night. It was close to midnight, That Man was out of town on business, and the wee beasties were asleep. Glad to hear everyone is safe and sound.